We arrived in California in the fourth year of the drought. It didn’t rain often last winter but when it did it poured, and the Santa Rosa Creek — which had been trickling through our neighborhood — became a torrent. As I watched all that precious rainwater rushing away to the Russian River, and thence to the Pacific Ocean, I wondered: What’s California doing to capture that water? The answer so far seems to be: Not much. The need for large-scale water storage has been long discussed, but (at least from my newcomer’s perspective) not seriously considered until the recent crisis. The picture worth a thousand words was of Governor Jerry Brown examining bare ground in the Sierra Nevada Mountains last March. That ground should have been covered with deep snow. Since that photo was taken, he’s hooked it up to a pump. 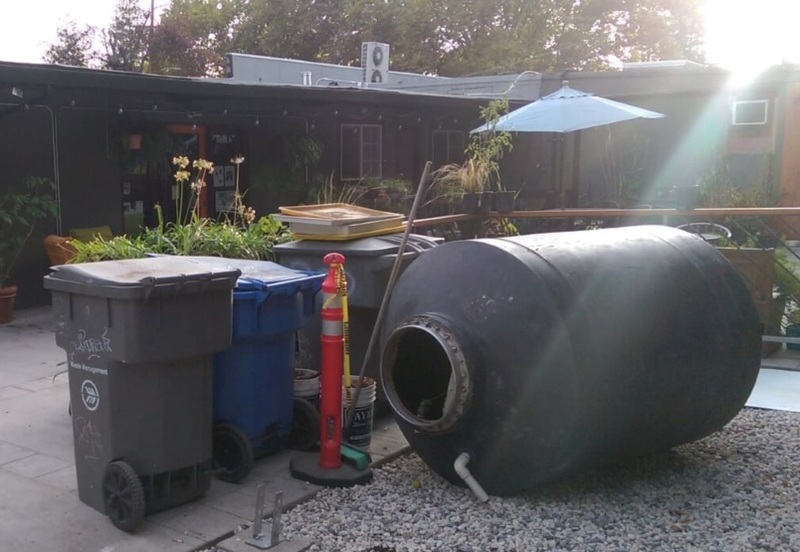 Rainwater flows off the roof, it’s pumped into the tank, and then it irrigates the plants. It’s a wonderful idea that I’m sure has occurred to other homeowners and businesspeople, but you don’t see many other implementations around town. And as El Niño approaches, other priorities will understandably loom larger. Hydro-engineering projects, even relatively simple ones like this, are daunting. And the problem really needs to be addressed at much larger scale. The excellent 2014 PBS Nature documentary Leave it to Beavers describes how beavers modify the landscape to retain moisture. It turns out that beavers don’t only create ponds by damming creeks, the excavate ponds deeper, allowing them to hold more water. Biologist Glynnis Hood, Ph.D., who has been studying beavers near Edmonton, Alberta, described how important a role beavers play in Alberta by holding water. I’ve always enjoyed watching beavers and thinking about their effects on my local environments. But I never realized that the species as a whole can provide a critical ecosystem service at large scale. Here’s hoping that California will recruit them to help us replace a dwindling snowpack with water stored on the land. And that, as a bonus, I’ll get to see them more often again. Author Jon UdellPosted on 4 Jan 2016 5 Jan 2016 Categories . I always thought California didn’t do enough to capture the water before it hit the ocean. Maybe the beavers can help. The article that made the links in my mind between flooding and drought was one by George Monbiot http://www.monbiot.com/2015/12/29/going-downhill-fast/ , the link being effective upland management (or lack of it in the case of the UK). Of course, the need for ‘bigger picture’ thinking and respecting evolved practices can also apply to other phenomena but that’s another story. Thanks Frances, that’s a nice connection. There’s growing interest in a variety of ways to store energy at scale. Can we develop the same interest in diverse strategies for storing water? Can Californians legally capture their rain water? There are places in the West that you can’t (like Colorado). Wow, that never would have occurred to me. Apparently it’s legal now in Colorado: http://www.nytimes.com/2009/06/29/us/29rain.html. California too: http://www.lexisnexis.com/legalnewsroom/top-emerging-trends/b/emerging-trends-law-blog/archive/2013/02/04/california-s-rainwater-recapture-act-lets-state-residents-capture-use-harvested-rainwater.aspx.